It was on May 1, 2010 that I preached a message dealing with the subject, The Wife of Christ Receives Both Legs of the Coming of the Lord: Remember the Feet! This was about the Mighty Angel, Christ coming down from heaven to earth in this last day. Now Christ, the Holy Ghost, was with the early church beginning at the day of Pentecost which we well refer to as the first leg of the coming of Christ as seen in Revelation, Chapter 10. Here in this last day we begin to see Christ in the fullness of His person, the Bridegroom, as He comes to take His wife. But this mighty anointing was lost after the church fell from its first love. (Revelation 2:4-5) Now it becomes very clear that was not the coming of the Lord as John saw it there on the Isle of Patmos, although that was Christ in them at that time. Now the Word of God teaches that He put one foot on sea, and one foot on earth in Revelation, Chapter 10. But first, I want to tell you about a dream I had when I was doing The Interpreted Book of Revelation in the 1970s. I had gotten to a place in Revelation, Chapter 10, that I did not understand and I was saying, "Lord, I don't understand what this means, that the Mighty Angel came down and put one foot on sea and one foot on earth and how Christ is in the earth. I believe you've always been here, but it looks like you are coming to the people again and I don't understand how it fits." I was praying and thinking like this when I fell into a deep sleep and had a dream; it was very real to me. In the dream, I was walking through a pasture towards an old farmhouse. I was walking up a little trail just kicking stones around and thinking while I was walking. Well, I got almost to the farmhouse and it appeared as if no one lived there; it was just an old farmhouse in the meadow. So as I walked towards the old house, I noticed the door to the house open as I was approaching, and a man came out on the porch. He had a bullhorn in his hand. It was something like what policemen use to talk through to make an announcement or to direct a crowd. He raised the bullhorn to his mouth and said with a loud voice, "Remember the feet!" Then he lowered the bullhorn down to his side, turned around, and went back into the house and closed the door. Then I woke up. Those words were ringing in my ears, "Remember the feet!" Well, I associated the dream with what I was studying on - Christ coming again. But I knew He came on the day of Pentecost. I couldn't quite get it all together where it would make a complete total revelation. After waking up, I thought on it a little bit; then went back to sleep. Upon waking up the next morning, I began the Book of Revelation 10:1-2 again where I had been studying prior to going to bed the night before. I had read about the feet many times, but it seemed I would read right over the top of it. But this time the word "feet" just grabbed me; it was something I needed to get into my mentality. That's why in the dream the man walked out on the porch with the bullhorn. I couldn't associate anything else with the dream but those words, "Remember the feet!" That was the only three words that were spoken; then I began to study and see a picture form and it started to make sense to me. So that is what I want to deal with and show you where we're at in time. Now we have the understanding that to the bride of Christ both legs of the coming of Lord are made known, and how it all fits; and we can look back and see how it all began to take place. Please read the book or listen to the audio below to receive the complete understanding of both legs of the coming of the Lord in this end time. 9. Painting a Center "LINE"
25. After Two Days We Lift up the Voice Together! 31. 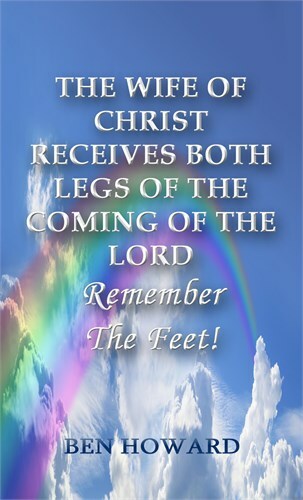 The Wife of Christ Receives Both Legs of the Coming of the Lord - Remember the Feet! 49. Is There a Greater than Paul Here? In Such a One I Will Glory!